There goes Paul Krugman talking crap again! 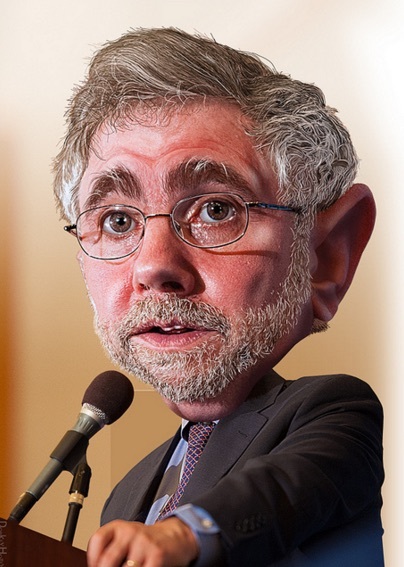 Who does Paul Krugman, the economist & NY Times columnist, speak to? Who is his audience? Does he actually impress progressives? Because he is proof positive that you can hold a PhD & still be dumb as a stump. Either that, or he’s completely amoral. He recently wrote a defense of Obama for Rolling Stone magazine calling him “one of the most successful presidents in American history.” Enough with the hyperbole! What about all those wars? He also wrote a defense of Clinton & criticism of Sanders (saying Sanders “needs to disassociate himself from voodoo of the left”). Krugman’s fully committed to the Democratic Party establishment. How anyone can respect this schnook after more than 20 years of his defending sweatshops boggles the sane mind. In that pompous professorial tone of his he says things like: “Given their low productivity, countries like Bangladesh can’t be competitive with advanced countries unless they pay their workers much less & provide much worse working conditions too. The Bangladeshi apparel industry is going to consist of what we would consider sweatshops, or it won’t exist at all.” To his amoral & racist pea-brain, that suffices as a defense of sweatshop economics. So once again, who does he speak for, If not the oligarchs massively profiting from sweatshops & the exploitation & dehumanization of working people? He thinks he’s being clever & disguising his idiocy when he writes about voodoo in economics & politics. There’s nothing more voodoo than a stump trying to explain away the degradations of capitalism. 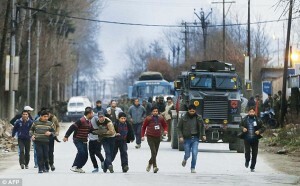 Media is filled with requiems for Indian commandos killed in a shootout with three Kashmiri activists cornered in a government building in Pampore, not far from Srinagar. They’re laying the tributes on heavy, listing the military honors each commando has accrued. 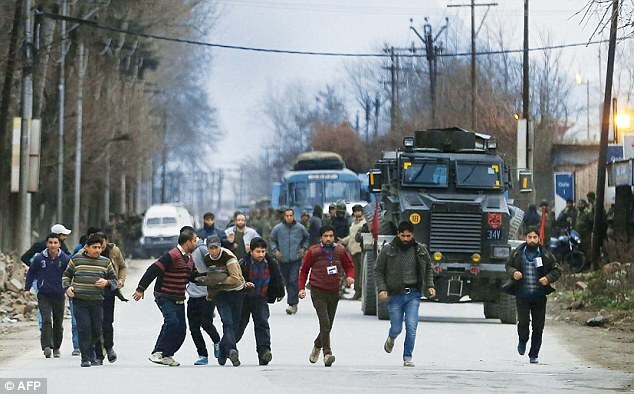 As the story is reported, Kashmiri “militants” (the code word for activists hunted down & executed by Indian troops) using automatic weapons ambushed a convoy of paramilitary commandos from the Central Reserve Police Force (CRPF). In the ensuing gun battle, the “militants” took refuge in a government building. They allowed the civilian employees to leave the building (seen in this photo) but continued the standoff with Indian troops which now involved the Indian army & paratroopers. At least three Kashmiri activists were killed & the shootout ended when the building went up in fire–likely torched by Indian troops (unless you think evil fairies from outer space were a third party to this encounter). Let’s take that story apart to expose what more likely happened. Maybe some armed Kashmiri independence fighters ambushed the convoy; more likely they didn’t. If they did, they are not the guilty parties in a brutal military occupation. Their strategy of guerrilla warfare may be misguided but they are not the criminal element here. The oppressed have the right to defy their oppressors by any means necessary & Kashmir’s freedom struggle is no exception. The CRPF are India’s special forces, paramilitary counter-insurgency troops–psycho operatives like the Green Beret, recently accused of war crimes (again) in Afghanistan. These are the troops involved in the disappearances, torture, executions in Kashmir. These are the commandos armed by Israel with special assault weapons which are standard infantry weapons for the Israeli Defense Forces in their occupation of Palestine. The CRPF was using AK-47s for terrorist sorties but the X-95 assault rifles from Israel are now the first choice of special forces in 46 countries because they are more versatile & deadly. These are the commandos specially trained by Israel under long-term contracts between Israel & India. During the ambush & siege on the building by Indian commandos, hundreds of Kashmiris in the Pampore region poured into the streets to protest the assault & support those in the building. The protesters, defying the psycho commandos, army, & paratroopers, chanted against India’s occupation & threw rocks–which the soldiers answered with tear gas & pellet guns. Fifteen protesters were also injured–some of them probably seriously by pellets. Supporters of Kashmiri self-determination will be expected to condemn alleged activist violence as supporters of Palestinian self-determination are goaded to condemn Hamas rockets. One again, we may disagree with strategies & even express our disagreements–but we don’t equivocate in our solidarity or tell the oppressed how to fight their battles. Our solidarity stands unconditional. India out of Kashmir! End all military aid to India!